File or instruct your attorney to file a petition for administration of the estate in probate court in the decedent’s county of residence. The petition should recite the names of all heirs to the estate, whether or not they are over the age of majority and of sound mind and request that the court grant letters of administration, giving authority to the petitioner to probate the intestate estate. Some states require that the administrator be a resident of the state where the estate is being administered. Petition the court for a sale of the property if a purchaser is available and the property must be sold to divide the proceeds among heirs or to pay debts of the estate. The court may grant your petition and order a sale of the property free of liens or claims, with the money being paid into the court for distribution to heirs and creditors. Convey or deed the property by administrator’s deed pursuant to court order once authorized by the court to do so. If required by your state, file an administrator’s report of the sale with the court and pay any proceeds as directed by the order, either to the heirs, creditors or into the court. Once the report of sale has been reviewed and approved by the court, an order confirming the sale by the court may be entered. Execute an administrator’s deed to all heirs in equal shares or as ordered by the court, once the administration is complete if there has been no sale of the property to a third-party, uninterested purchaser. Record the deed in the land records for the county where the property is located. Determine all heirs of the deceased under the state’s intestate succession laws. Laws may differ from state to state, but generally, the primary heir will be the spouse who inherits the entire estate or a share with children, sometimes depending on whether or not there are children from a previous marriage. If there is no spouse, children of the deceased will ordinarily acquire the property jointly. If there are no children, parents inherit, then siblings. Prepare or have an attorney prepare heirship affidavits to be signed by two disinterested parties who are familiar with the family and know the heirs and lineage. Heirship affidavits confirm the names of all the heirs of the deceased. Instruct the people signing the affidavits to sign in the presence of a notary public. Prepare or have your attorney prepare a deed from all of the heirs to the purchaser that complies with state law, provided they are all adults and mentally competent. The deed should state that all are heirs at law of the deceased and it must provide a proper legal description of the property. It should also include a proper notary acknowledgement for the state where the land is located. 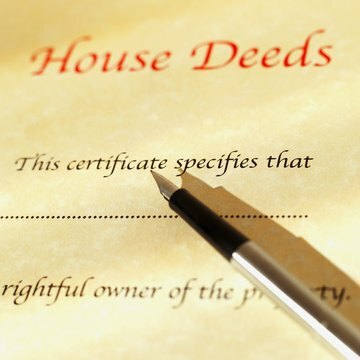 Instruct all heirs to sign the deed in the presence of a notary public. Record the heirship affidavits and record or instruct the purchaser to record the signed and notarized deed in the land records for the county where the property is located.